You were planning for a long time then finally you have decided to buy a new smartphone, Great! This is one of the tricky and hard tasks these days to find the best smartphone overall as there are lots of variety phones are available in the market and they are still coming on every month. Users seem confused about what features to look for when buying a smartphone? To answer this; this article helps you to choose a smartphone that best suitable for your needs. There are lots of different things & factors which you need to know before buying a new smartphone, but here we have listed few but most important quick tips and those things you must consider to check carefully. 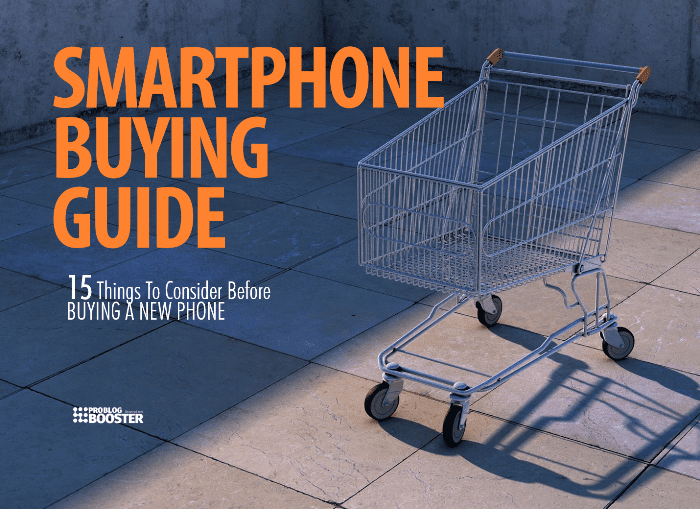 Don't forget these things to remember while buying a smartphone. If you’re purchasing your first smartphone and figuring out the best smartphone to buy, then you are on the right page. This smartphone buying guide includes everything you require to consider before you go to buy a brand new phone, including about the best smartphone brands, the most working operating systems, camera quality, screen size, processor types and so on. Moreover, I'll try to provide useful info about all strong buying options on the market grouped by features. Use this information to make sure you buy the best mobile phone for your requirements and in your budget. Yeah, the budget is the first and one of the most important factor, but it should not compromise with the quality of the product. But one more thing I want to underline that if you want to buy a satisfactory smartphone for all your needs; your budget must have a bit more flexibility. The Android, iOS & Windows are the most preferred operating systems in the market. The Nougat is the most recent stable Android OS that supports fingerprint authentication, better battery life & offers pay option. In addition to this, the latest Android Oreo has better multitasking & multi windows ability. All the iPhones have iOS which are most sophisticated look and have a variety of features compared to Android. Windows are still evolving so better to choose an Android version of OS as because of customization and better flexibility in apps. If you want to buy a mobile especially for browsing intent like for Facebook & WhatsApp like apps, then a mobile with 2GB RAM & the dual-core processor is fine but for more functionality, you should have at least 4GB RAM and high-speed processors like Quad-core, Octa-core, or recently released Snapdragon 810 & 820. A smartphone with Snapdragon 820 processor and 6GB RAM has great speed for games and has improved multitasking ability. In today's generation of HD & 4k videos you need to have more internal as well as expandable external storage feature and it is the reason why the smartphones come with 16GB/32GB space. The internal storage capacity along with expandable up to 64GB or even 128GB is the preferred mobile devices. Most of the iPhones have min. 16GB internal storage these days & do not have a place for external storage which resists expanding storage capacity. Whereas on the other hand, Android phones come with a special slot for external SD card having memory expandable even up to 128GB that you can go depending upon your need. Minimum 8 hours battery backup is essential. Battery endurance is basically much more important when you play high-resolution games or watch HD/4k videos on mobile. The battery capacity should be of 3000/4000 mAh min. Wanna takes selfies. Oh for such a reason a smartphone must have the 8MP/13MP camera. But if you are not interested in taking photos and/or shooting videos regularly and looking only for other necessary features then a 5MP camera is often useful. Moreover, iPhone 6s & 6s plus have a f/2.2 aperture which is higher than some Android phones as they have f/1.7 aperture getting their dual pixel camera to exert quick and fast autofocus action & to take outstanding photos. Nowadays most of all smartphones come with GSM 4G slots which give flexibility and is good network carrier, but on the other hand, CDMA phone has better voice quality and have more affordable plans for the particular carrier, but those phones run with CDMA cards only. Also make sure you are buying 4G phone. Your smartphone must have a Wi-Fi connectivity. For better, faster internet surfing, it should be a 3G/4G feature. The 4G LTE will give the best speedy experience for all your downloading need. Sometimes you may want to have a light-weight mobile or heavy mobile, but that doesn't interfere with the quality of the product. Most suitable and an average size of the screen size is 5.5". Tablets have larger screen size, so they are useful for multitasking work, playing higher games, watching HD videos, but due to their large size they are difficult to handle with one hand & gets problematic to carry. Therefore a display ranging from 4.5 to 5.3 inch is compatible. For better picture quality the screen resolution should be 720p min & for best experience 1920x1080. Best selling iPhone screens are still running by the maximum of 1929x1080. Comparatively, Android phones have acquired more resolution than this. Samsung A8 comes with 2560x1440 whereas Sony Experia Z5 have 4k (3840x2160) resolution. The smartphone should have a connectivity slot to connect pen drives so that you can watch & enjoy the videos & photos stored on it. That can help to save space on phone & SD card. It should get connected to the TV also in an easy way. Most of the time, it is seen that interest stick with new mobile for just one month or more, and then people used to use it with a daily routine. But the apps compatibility keeps your interest for a long time. Android has the biggest market having millions of apps compared with Windows, iOS or BlackBerry app store. A variety of apps makes you try new things and discover the hidden features of your smartphone. I have seen lots of goes with features that have less cost, but they forget about the BRAND which has durability and after service. Always try to stick with branded smartphones. The unbranded smartphones overview may attract you but after some time lapse, they may let you pay more than the cost of your mobile. Take or check reviews before buying a smartphone and do not forget to test the quality. [e.g., camera, video quality]. You can save money by buying an Android phone in comparison with iPhone as they have somewhat the same features in respective categories. So while buying a smartphone, you must have a closer look at all the above suggestions. I can bet these will surely help you get a smartphone of your choice, requirements and the use. If you want to add some more points, then you can suggest with comment section shown below. And don't forget to LIKE, SHARE & SUBSCRIBE the regular updates.